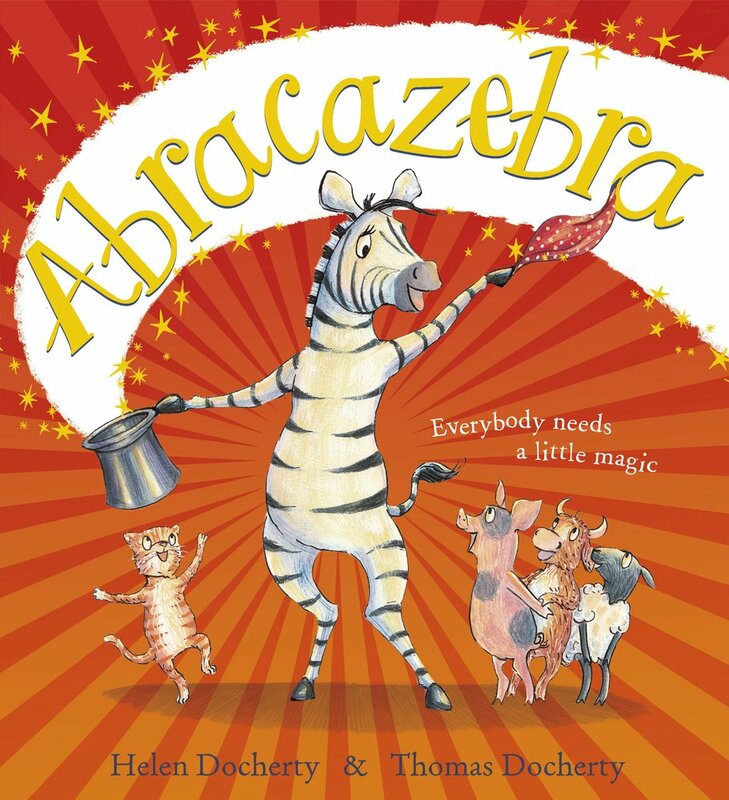 This week, to celebrate the (U.K.) release of “Abracazebra” by husband-wife team, Helen and Thomas Dorcherty, your lit. 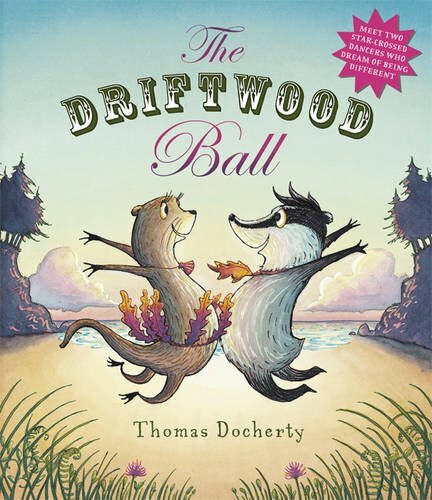 rat decided to treat you to an encore of our reviews for “The Driftwood Ball” (a solo outing for illustrator Thomas Docherty) and “The Snatchabook” (their previous collaboration) which happily is available in the U.S. and Canada. Yawnalot’s a small town where not much used to happen. Even so, crotchety old Goat’s the bighorn on campus, until “Abracazebra” and her traveling magic show comes to town. The townsfolk are enchanted not by her slight of hoof, but her inner charm and friendly nature. Goat grows jealous the longer she stays, and when it looks like the zebra’s ready to settle down in Yawnalot, he tries to turn the town against her, and succeeds! Only to realize the real “magic” is friendship, and that there’s room for everyone to shine. Helen’s rhyming prose doesn’t skip a beat, and Thomas’s sprightly use of two-page spreads provides the reader a flowing reading experience that makes it prime read-aloud material. While “The Snatchabook” took some bold and creative risks, and is one of the most original homages to the beloved Dr. Seuss, “Abracazebra” uses a simpler rhyme structure which makes it a great book for parents and teachers new to reading aloud to perform without worrying about tripping up the rhythm. But Helen was kind enough to send your lit. rat a copy, signed at that! While T.A.A. normally reviews books that are fairly accessible worldwide, we also believe that sometimes the best books are worth a little extra effort to obtain. Abracazebra is one such book. When/if this OFFICIALLY hits stateside, your lit. rat will let you know. But if you can afford to import, I promise it’s worth it. In addition to collaborating with his wife and fellow author Helen(See our profile on them from our Picture Book Month 2013 author/illustrator spotlight), author-illustrator Thomas Docherty brings us his most recent solo outing about family feuds, high stakes dance offs, and true love, what more can a lit. rat need? On one side you’ve got badgers, who are prim, proper and composed, in dance terms they’re like a waltz. Form and technique are everything! The otters by contrast are cool, casual, and thrive on improvisation, in dance they represent freestyle, with some hip-hop thrown in here and there. Whatever’s fun and flowing! The Badgers find the otters crude and their dancing unrefined. The otters think badgers are snobbish, wound too tight, and their dance moves stiff and soulless. The only thing both species agree on is their love of dancing, but while “The Driftwood Ball” brings the two species together, competition and rivalry keep them apart in every way. What I love most about Thomas Docherty is how he tailors his illustration style for each of his books, be they his own, or when visualizing another author’s work. While there some slight nods to the style used in “The Snatchabook” his previous book (written by his wife, Helen) this book is about movement and a more tropical color palette, versus the Seuss-inspired two-tone impressionistic tone taken in the verse-driven tale. That’s why I want to give special thanks to my Twitter friend, Anne-Marie (@ChildLedChaos), for sending me a copy from the U.K. You made reviewing this book possible. I hope “The Driftwood Ball” comes to the rest of the world soon, but while T.A.A. 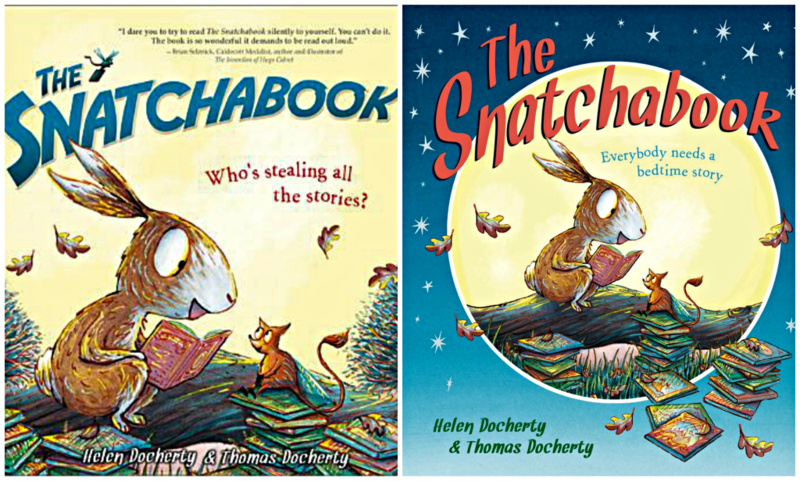 primarily reviews books that are fairly accessible worldwide, our goal is to be as global community as possible, and while many of Thomas Docherty’s older solo picture books solo books are available worldwide, this sadly remains a U.K. exclusive, but when that changes, T.A.A. will let you know. That said, for our Euro/U.K. T.A.A. fans, “The Driftwood Ball’s a must-read, especially if you’ve got little movers and groovers in your life! This book earned the honor of being one of our “Most Anticipated Reads of 2014″, and if you’ve the spare cash and patience for intercontinental shipping, this is a book worth importing! Okay, to end on a wallet-friendly note, check the final word on Helen and Thomas’s previous collaboration, and in my opinion one of the best books of 2013 that’s made it stateside! In the forest, books and story time are celebrated and sacred (You know, really super important), but books start going missing, ruining the late night joys of story time, whether it’s the one reading a book to themselves, or a family reading to each other before bedtime, and a rabbit named Emily is determined to find this thief of books and get them back. The Snatchabook manages to envoke a feeling of nostalgia (For those of us old enough to have that perspective, and you don’t have to be 30+ to have it, in my opinion…) and deliver the modern reader’s demand for quick moving tale that lingers in the RIGHT ways and for the right REASONS. Something that may sound counter-intuitive, but something you’ll get when you read this book for yourself and/or to others. 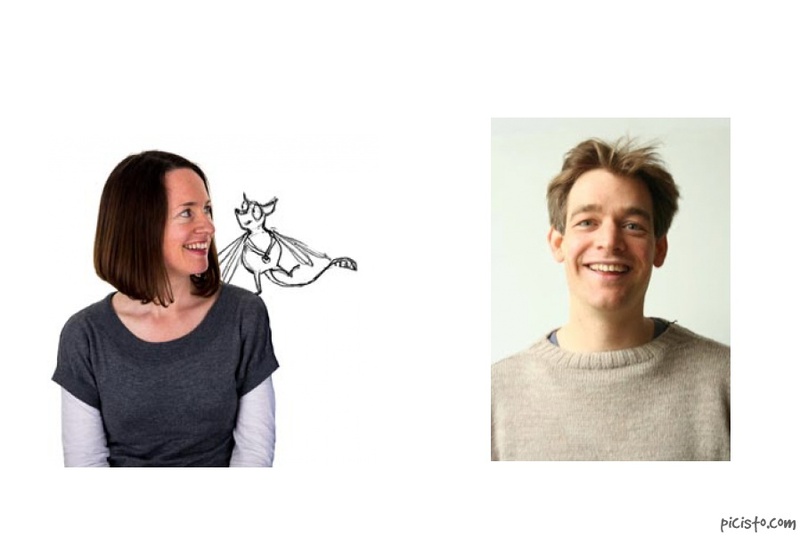 But make no mistake, this story is no fake wannabe, when your literary rat compares ANYTHING to someone as beloved (And often debated about) as Seuss, it’s NOT faint praise, and is still a solid title in its own right, and Helen and Thomas Docherty have a lot to be proud of. “The Snatchabook” is their second collaboration in book form, and I believe it will be known as their breakout work, you heard this first from your Literary Rat, I highly recommend it, and that will be that. FINAL NOTE FROM THE LITERARY RAT: If my ramblings convinced you to buy one or more of the books mentioned above, please support T.A.A. by clicking on the affiliate cover images above or links within the review.